And so it is that I find myself flying back to London. 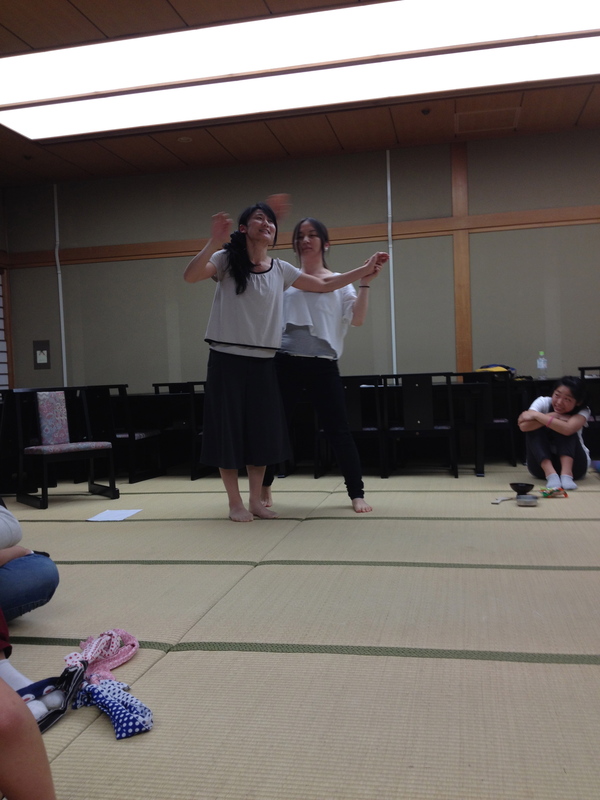 The last month or so has been a fast moving – collectively propelled – vibrantly tangled mass of ideas, plans, schedules, Japanese, English, Jap-lish, meetings, workshops, creativity, games, slight stress, greater joy – and finally, a performance. We have been moving between rehearsal rooms, hostels and hotels, states of panic and relief, without many boundaries between work and rest. Consequently, there haven’t been many gaps to reflect, or much mind space to devote to it. But, as I edge further from away Japan and closer to London – my inflight entertainment systems informs me that I have five hours left – the gaps are slowly starting to appear. At the culmination of any idea, it’s always tempting to go back to its roots – to think of the first forays into trying to make something happen and how the seed was initially planted. In this case, the thing that got us moving was a Daiwa Foundation deadline – and a feeling that, if this project was ever going to happen – this was the time to do it. There seemed to be nothing to lose and everything to gain. Fortunately, we got this grant and the seed was duly sown. From there, we hoped that by starting the project and beginning to make the work, we would be in a better position to bring in the funding that we needed– stage by stage. Thankfully, that is how it worked out and thankfully, it felt like a genuinely good investment of money and an important, necessary piece of work. So, why and how it is necessary? Have we managed to change anything, to help anything grow, added anything to the story of Hiroshima and to peoples’ lives? A more formal response to these questions will soon emerge from a beautiful, spreadsheet-based chrysalis of quotes and statistics, aims and outcomes; but that particular life form is still growing. Whilst it is being hatched, I would say this. The people of Hiroshima, and any visitors to the city, were not seeing a fictionalized piece of work, nor were they seeing a singular version of history through one account/testimony/interview – but that they were an active part of an interwoven portrait of real people, real voices real experiences and real histories. The and children that were in front of the audience – embodying the stories of the children that lived through the bombing – were not children in 1945, but they easily could have been. The voices of elders summoned younger version of themselves and put these selves in front of us. The feint thread of time between the “then” and “now” grew turned into an infinitely more tangible line; moments from long ago landed in the space in a tumble of plaster falling onto a young girl, a teenager being trapped under a roof, a young boy racing around the city to see his mother die in front of him. In the day-to-day living of life, there are not many opportunities to fully engage with and consider the foundations of what our lives are based on, or to consider a set of circumstances linked to our lives – but so vastly different from them. We may get these chances remotely – through television or books – but it seems rarer to come across them through a physical, shared relationship between people. The notion of remembering the past and learning from what has gone before, can be flippantly referenced and given much lip service, but to actually be present in a space devoted to creating these opportunities, feels important. Whilst I am obviously not a Hiroshima citizen and cannot speak on their behalf – we’ll have to wait for the chrysalis to crack to get a full pictures of responses – from the conversations that I did have with audience members after the performance, it felt like they were able to be very present in the experiences of those who lived through that day; that the link connecting themselves with their descendants felt much stronger. Why is this important? Perhaps because as humans it is our job to gain information from the past and to use it to help us evolve; whether it is our cells doing that job at a molecular level, or our thoughts and actions – the notion of progress is central to our existence. It seems that whenever we brush up meaningfully against the monolithic enormity of the past to gain courage/understanding/context, in whatever small way, positive things happen. The 20 people that performed in the play, all of different ages, with varying amounts of experience, referenced the fact that the play felt more “real” than most things they had been involved with. Fiction in theatre obviously has its’ place, but trading in reality did define the form, style and dimensions of the performance. Perhaps this is because the story had equal relevance to the performers and the audiences – they were sharing in a narrative that defined all their lives. Through this fact, the audience was implicated as a major part of the production – no less important than the actors or scenography. So, we did it. I think the general consensus was that we were all very glad that we did. Now, the question is – as it always is in the case of trying to forge progress – what next? “This project officially began in August 2014, with interviews between local children in Hiroshima and survivors of the Atomic bomb. In reality, it started long before that. In 1997, I came to Hiroshima for the first time – as part of a school exchange group. We had just had a death in my family, and this death had sent ripples through the lives of all of us. When I visited the Peace Memorial Museum and learned a little of what happened, I was stunned. What had just happened to my family had happened to almost every family in this city. In one minute. At 8.15am on a Monday morning. These were not natural deaths or illnesses; this was an apocalypse entirely of our own making. Quite a few years later – and following a two-year period living in Japan – I was working with London Bubble, a community theatre company, on an oral history and performance project about the London Blitz of 1941. The project, rooted in interviews between children and survivors of the Blitz, culminated in an intergenerational, community performance. It seemed to go down well. We wondered whether we could do the same project in Hiroshima. And here we are. Gathering the stories of the survivors last August was an incredible experience. Looking into the eyes of elders that have witnessed the un-watchable and seeing them share their memories with children was a complete privilege. As we have moved down the tracks of the project and gathered collaborators, company members and friends – we have seen these stories being passed from person to person, and from page to stage. The people that have helped us to unearth these stories and who have shaped the way we tell them, are the people that will now share them with you. This form of theatre making is relatively new in the UK, and we’ve found it an enjoyable way for information to be explored. It blends the energy of the young and the knowledge of the old – it also allows the children to sometimes lead and the adults to stand back and learn. Most importantly it provides an opportunity for communities to come together to empathise and share things that can’t always be properly honoured with words. 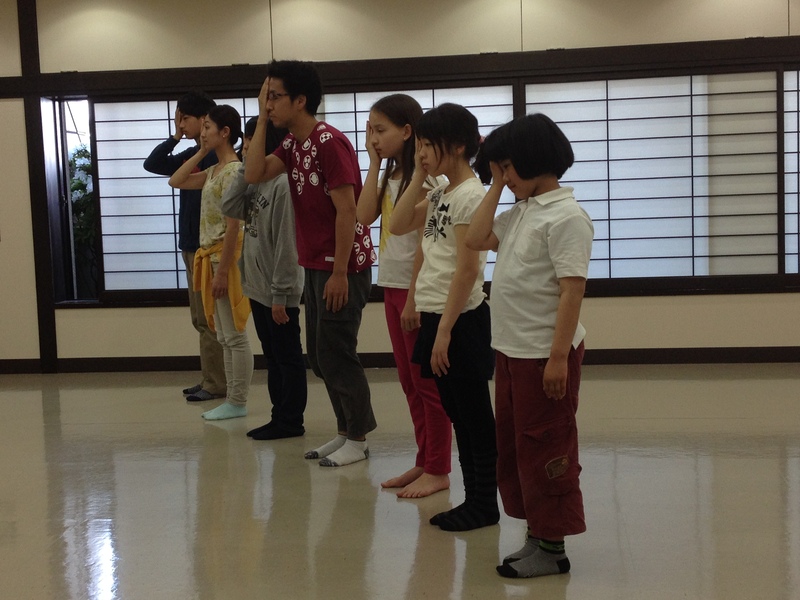 It is our hope that we, as theatre makers, can add something of value to the telling of Hiroshima’s story. The people of the city are here today to share the narratives of some of those that lived through that day; they are here to commemorate the lives that were lost and to honour the individuals who have carried these stories through their lives. These stories now need to be passed onto the younger generations, so that they – and we – can learn from what has gone before. In the words of Shakespeare – “what is done, cannot be undone.” The atomic bomb cannot be un-invented. What comes next is anybody’s guess, but perhaps it involves not only committing to peace – but to developing a genuine understanding of conflict: why people, and countries, feel the need to arm themselves and how the deadlock of power and control between nations and individuals can begin to be dismantled. We hope that this performance has something to offer to this conversation. I rolled into Tokyo a week and a half ago; it was the first landing of many. As we hit the tarmac and our pilot kindly informed us, in the clipped tones that are surely a pre-requisite for any British Airways aviator, that we were in Narita, I – in theory – believed him. It was the destination on my ticket and I would have been disappointed – nay furious – had we landed anywhere else (expect perhaps in Fiji, that would have been lovely). After 12 hours of being in India with the elite of the British acting industry (the Second Best Marigold Hotel), in some unidentified part of the US/outer climbs of space/nigh on complete confusion about relativity, gravity and pretty much everything else (Interstellar) and then in the midst of the various eating/reading/trying–to-fall-asleep pursuits that characterize any long-haul flight, I could have easily been anywhere. The second landing was in a bowl of udon noodles at Haneda airport – Hiroshima bound – and I found myself edging closer to fully arriving. The third landing was in Hiroshima airport and the fourth and final landing was in a perfect array of sushi, tempura, sashimi, beer and the company of a long-standing project supporter and friend. I had arrived – all of me, and very nice it was too. The first couple of days were a gentle whirlwind of pulling various project threads back together and getting started. There were meetings, there were meals – all underscored by a feint but discernable tone of slight panic, primarily caused by the fact that everything had seemed to have got very late. In waiting for various funds to come in – and a big thank you to the Arts Counci/British Council/Niwano Peace Foundation for the fact that these funds did come in – we had been on pause for the last 2/3 months. On the other side of the greenlight, time was precious: it was do-able but we were going to have to pretend we were on challenge Anneka. Well, I am preserving that pretense on a solo basis – I’m not sure it’s a reference that would easily transcend cultural barriers. Were it to do so, it probably wouldn’t have been worth the effort. There was a marketing campaign to kickstart, flyers to distribute, tickets to be sold-sold-sold, extra participants to recruit, a script to finalise, a production team to gather, a set/lighting/sound design to consolidate, extra accommodation to secure (should you ever want to bring a team of people to stay in Hiroshima around August 6th, especially on a decade-based anniversary of 1945 – book 10 years in advance, if you book now for the 80th anniversary, you should be fine. Just). From landing to kick off – we would have just over three weeks. We now have just over a week and a half. Eek. Seeing the cast for the first time since April was ace. We played our favourite games – and yes, Zip zap boing was amongst them – re-formed as a company and read through the first draft of the script. We reflected on the draft, discussed what we would improve and began to move forward. More and more people were set to join us over the coming weeks, but it was heartening to have the core company members that had worked with us in April; they had been at the roots of the creative exploration in April and it felt right that they were leading this stage of the project. There have been some sobering moments too. One of the survivors that had been working/playing with us in April and who had joined us for the first rehearsal – has expressed real reservations about the way her experiences and memories have been represented. She has asked for her sections to be removed from the script and won’t be joining us en route to performance. It is difficult to imagine how strange it must be to have some of your most traumatic, life defining moments presented back to you in a script, crafted by a team of people that barely know you and framed as the life you have lived. It was a hard, slightly painful lesson – and we have expressed our heartfelt apologies for any sadness caused – but it is a lesson one which we are determined to learn from. We are holding an open rehearsal on Saturday, to which we have invited all of the survivors with whom we did the original interviews. Before we start the rehearsal, we will briefly explain our process: that after doing the interviews, we worked with our community cast to dramatically explore the transcripts, that our playwright then embarked on the task of interweaving these stories to tell the story of the day and that, above all, we are trying to create a collective portrait of August 6th, the lead up to it – and the aftermath and the story of what comes next. At this point, we will warmly welcome feedback, reflection and intervention. Good news! Aster Plaza, the venue in which we are planning to perform, has offered the use of the space for free, including all equipment. Bonus. Practical, financial help is obviously brilliant, but the endorsement it brings is also a real coup. The Aster Plaza is a popular cultural venue in the city, Hiroshima-ites know it and best of all, it looks a little bit like a space station. Akiko, who works in the cultural division at the venue, has been coming along to the sessions and has put her neck out to give us this support. The support and contributions from a number of different participants has continued to be heartening in the extreme. 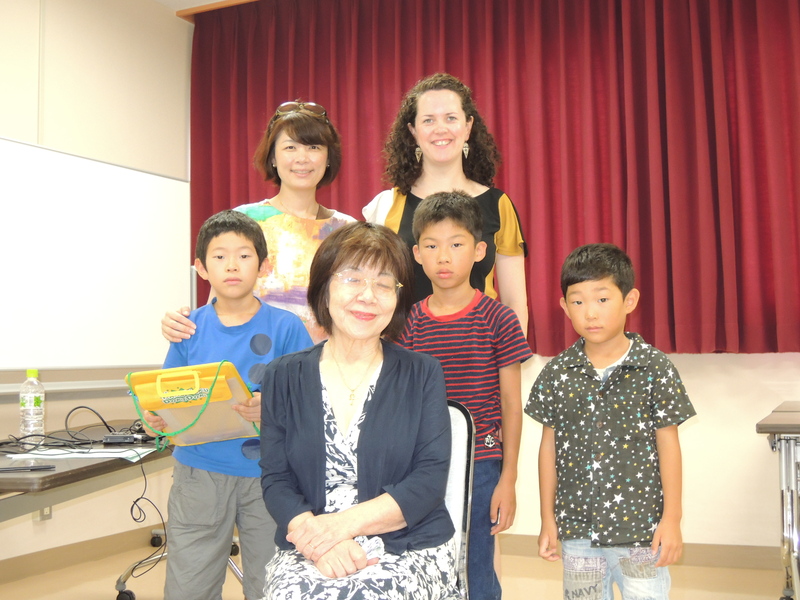 Mirei, mother of 11-year old twins Maila and Leona, has built us a Japanese website site, with an English sister site. Others are assisting us in our ongoing, and urgent, fundraising efforts. The roots of the project are spreading into the community, growing deeper and wider. It is exactly what needs to be happening. The scale, scope and heart of this project cannot be carried by a small creative team, all of whom live outside Hiroshima; it needs help to grow from the community whose stories we are telling. A huge thanks to them. Huge thanks also to our Japanese collaborators. Ogasawara San – the co-producer of the project, for being so efficient, dynamic and completely on it; Yorie and Yasuko – co-director and designer – for not only contributing their expertise as artists, but also for being translators at each and every session, I can’t quite imagine how difficult it must be to keep a cerebral grip on both of these things at the same time, but they do – and without their help, we would be doing a very different show; it would be predominately mime based and almost certainly rubbish. Misaki, the playwright, for diving in wholeheartedly to the challenge of working with a director in a different language and for doing so with humour and warmth. And of course, thanks to Peth for bringing a bit of Bubble to Hiroshima, helping us to begin to build a company and a show. Many other supportive faces and friends have been popping in and out of the rehearsal room and it’s been lovely to bring them into what we are trying to do. And so our time in the city is drawing to a close. On one of the final evenings, a big group of went out for dinner: Nori, Hiroki, Maila, Leona, Mirei, Peth, Kaz, Ogasawara San, Akiko, Yasuko, Misaki, Yorie Yuko and me. Everyone seemed to be basking in a sort of post-show buzz, chattering and enjoying each other’s company. In August, we had a similar dinner, but with half the people. Our company is growing. In another 3 months, we will hopefully be doing the same again, but with an even bigger company – and this time it will actually be a post-show celebration. Fingers crossed; we’ve still got a lot of money to raise. In amongst working on the funding applications that have dominated my last few days in Tokyo, I keep remembering something that happened in one of the sessions. It is good to remember these things, lest the project morph into one big spreadsheet and an even bigger bundle of aims and outcomes. We were working with an extract of testimony from a survivor named Teruko. 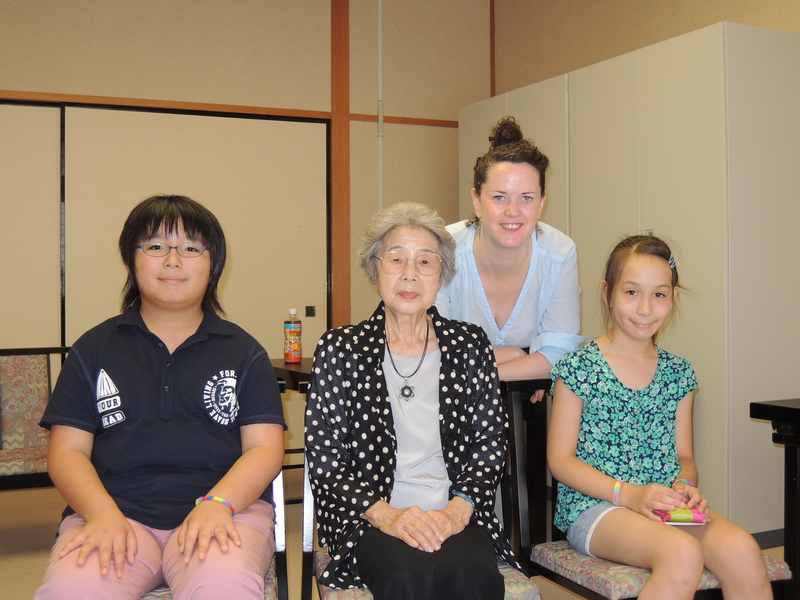 In the interview, Teruko was recalling an experience that happened at the moment of the bomb: her mum had grabbed a futon and brought all the family into one room. She used it the futon to cover everyone – in a sort of tent formation – and told them at least they were all going to die together and for that they should be happy. 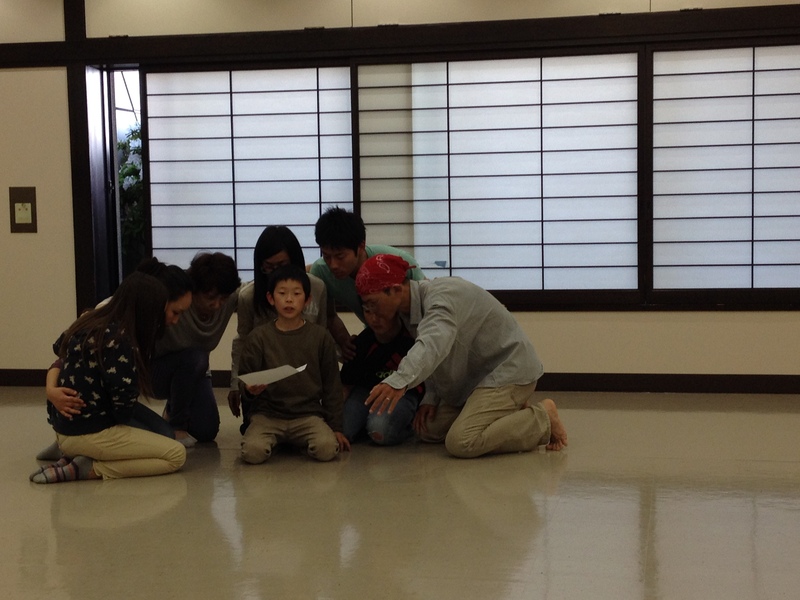 A group of participants were working to dramatise this particular extract and Teruko’s 7 year-old self was played by one of the twins. When we watched this scene, Teruko’s 77 year-old self was sitting beside me. Watching her, watching them was extraordinary. I turned to her and she looked at me, her eyes full. It was an important reminder that what is happening in the workshops is just as important as what we put on stage in August, if not more so: the connection between stories and people, people and people, generations and experiences. So once more, I have bid a fond farewell to the people of Hiroshima – or at least a few of them – and once more, I am readying myself for a life without pocari sweat. As we descend into Heathrow, I am massively looking forward to a curry and bed, but the last few weeks will stay with me, propelling me through an intense period of fundraising. So – Sayanora, or as I should say – adieu. Hope to see you again in August. Fast forward eight months and I’m back in the land of the rising sun, the addictive matcha latte and the cooling pocari sweat. 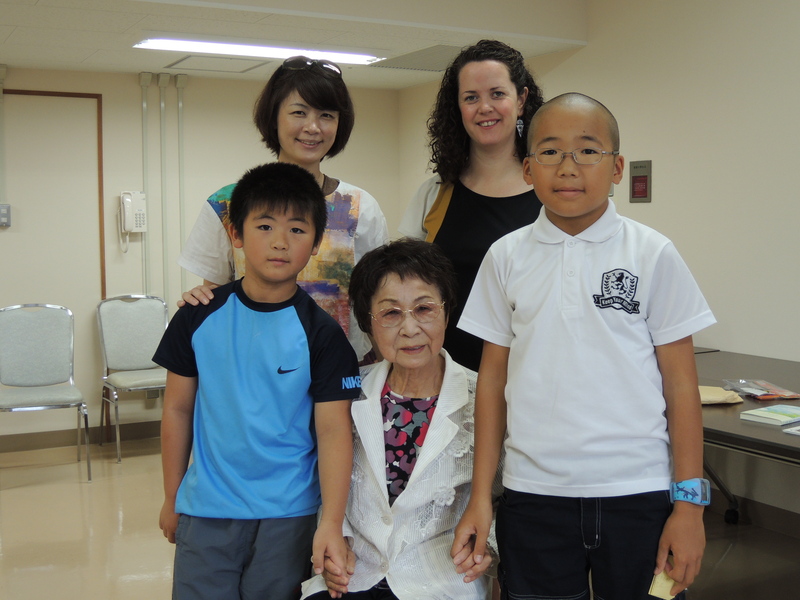 Between then and now, the Grandchildren of Hiroshima project has gathered pace and purpose. Funding applications have been created and submitted, interviews have been transcribed and translated and an international exchange has even taken place. 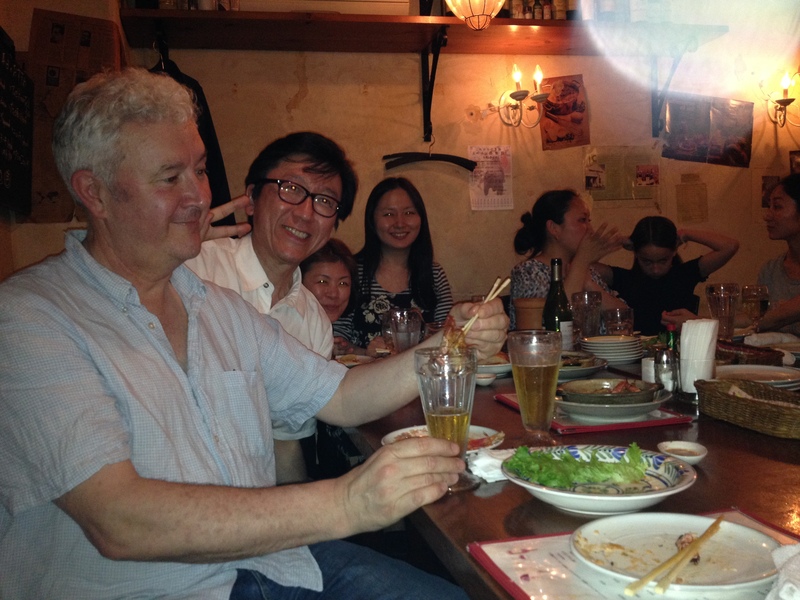 In January, Yorie (Co-Director), Misaki (Playwright) and Yasuko (Designer) came to London. The team visited London Bubble to learn more about the practice and methodology of the company and to plan for the next stage of the project in Japan. At this stage, the April workshops were an aspiration. The aim was to use the workshops to get a practical, creative sense of the stories contained in the interview transcripts, before we moved on to writing, rehearsal and performance. We also wanted an opportunity to start building our performance company; to begin to bring together an intergenerational community cast, who would carry these stories and tell them to their friends and neighbours with aplomb. 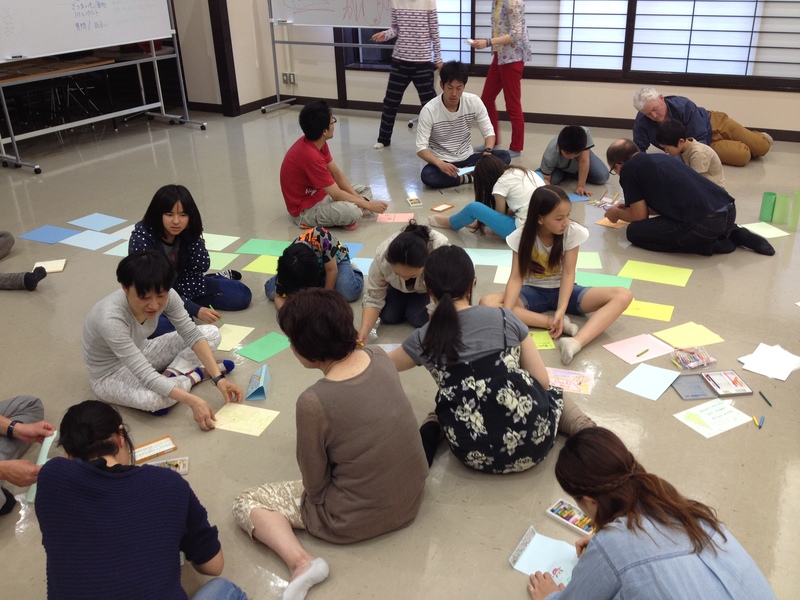 Thanks to a grant from the Sasakawa Foundation, we have spent the last week doing just that. Last Friday, the creative team gathered from at least two corners of the globe in a tiny backstreet hotel in Hiroshima. Having come directly from the hype and hustle of Tokyo, arriving in the city was a blessed relief. The rising sun was shining, people were pottering about their business and the world began to slow right down. We headed to a coffee bar to bang our heads together, in the true spirit of a peace-focused project, and ended up in a coffee bar with an unusual array of clothes and shoe-based merchandise, but alas – no tea. Coffee and shoes, it seems, can be the best of friends, but the classic, lower-caffeine content hot drink has no place betwixt these beans. I contented myself with an orange juice. Peth (Creative Director of Bubble and co-director of GOH), Yorie, Yasuko, Misaki and I talked about the stories/images/moments that had stood out from the transcripts. Thoughts buzzed, ideas whirred and we edged ourselves closer to a rough plan for the first day. Yet, in my mind, doubts had been lingering and rising: what if nobody turned up? What if people simply weren’t interested? For the last few months, I had been head-deep in my laptop, prepping plans with practitioners, sizing up schedules and sessions, researching rehearsal rooms but all the while, having little idea of who would get out of bed on a Saturday morning to work/play with us. 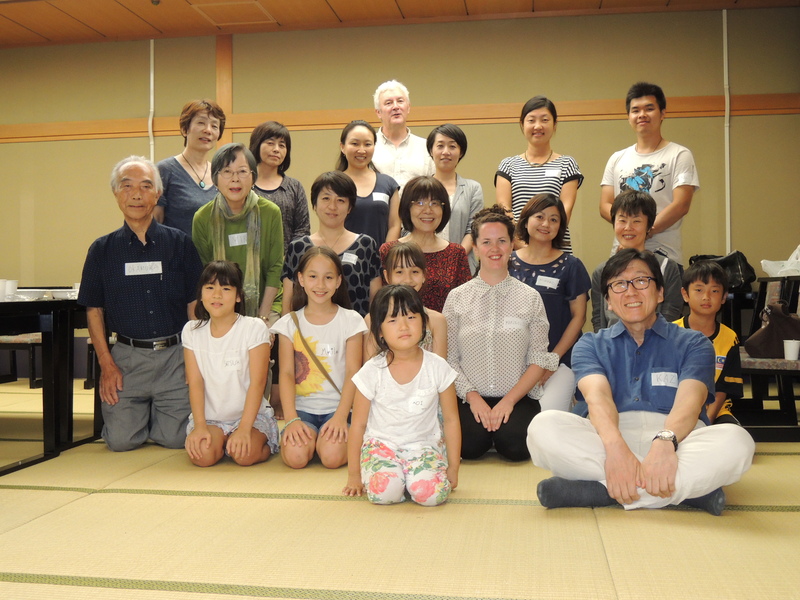 For all our talk of the project bringing the community together, playing a vital role in the 70th anniversary commemorations of the bombing and connecting generations – it would be a mass of white noise without the people of Hiroshima. And so it was with a slight sense of apprehension that we set up the ubiquitous circle of chairs. People started to turn up and hang around the room, making their first forays into conversation. Some faces were familiar – mainly the children that had taken part in the workshops in August – but most were new. We put away some of the chairs we didn’t seem to be using, only to have to get them out again several minutes later. The circle was full. We had the beginnings of a company. The people of Hiroshima, or so it seemed, were behind us. Phew. And so, in no particular order, those people are: Kaishu (10): Satsuki (10), Leona and Maila (twins,12), Hiroki (28), Nori (26ish), Teruko (late 70’s), Mirei (mother of twins, mid 30’s), Hibiki (10), Yuka (30)ish, Kantaro and Jun (brothers – 16 and 18), Aya (21), Akiko (around 30), Adi (25ish), Hikari and her mum (6 and a bit older than 6), Toshiko (77ish), Ucha San (early 30’s), Tanaka San (mid 30;s). All ages, all stages and a brilliant balance of genders to boot. A promising start. 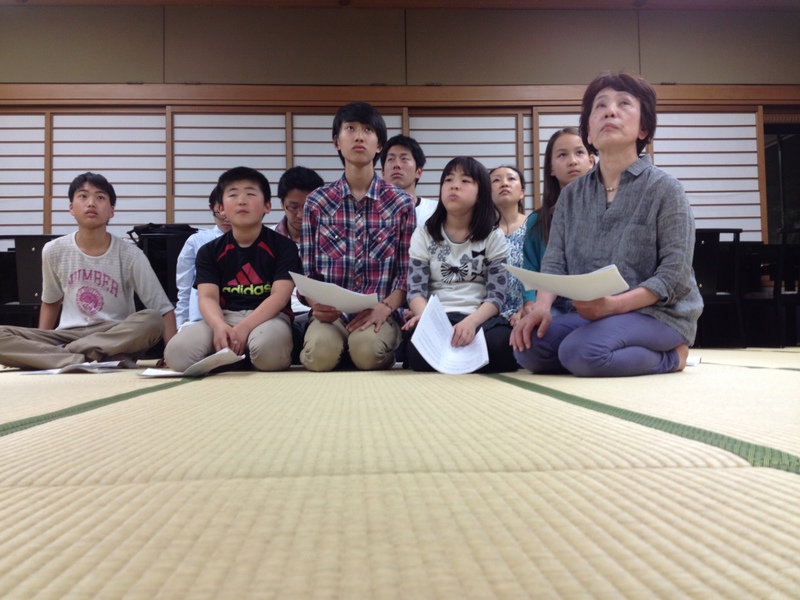 We got started with a classic hit of warm up games, encompassing the global favourite zip, zap, boing and then swiftly moved into working with extracts from the testimony of the survivors; images of b29’s, air-raid drills, a shattered Hiroshima and a swaddled, futon-covered family gradually filled the room. As the participants grouped together to tease the action out of these words and give the stories life and meaning, a realization began to surface: it was working. The approach we wanted to employ, the approach that we thought (and had been warned) might be too much/too different or simply just not matched to Japanese culture, was working as well here as it did in London. Over the course of the following week, the participants brought more and more of these stories to life and some striking moments were created: the haunting repetition of the air-raid drills wherein children were taught to block their ears and cover their eyes – lest their eye-balls pop out, the playful behavior of little children in amongst the ruins of the city, family scenes that brought together the scale of ages in the room and which brought an eery sense of reality to the devastation. Likely and unlikely friendships started to develop between folk of all ages (girls on the verge of adolescence flocked together, young men became boys again as they played with versions of their youngers selves) and the group started to become a company. The fabric of community theatre is as stunningly beautiful here as anywhere – the vast sweep and scale of images created, the varied textures of ages, faces and experiences, the direct transference of life into theatre and the sharp quality of the focused will towards collective collaboration and creation. As for communication, well – it’s a bit of a minefield, but we are all trying. One moment lingers; as we were playing a warm up game with the company on the first day – a game which involved making eye contact with someone in the circle, saying the Japanese equivalent of “me to you” and walking across to them – one of the smaller members of the company suddenly came out with the English version: me to you. We can all push ourselves harder and our little friend Kaishu is doing just that. I did try and write as I was darting out of Hiroshima on the speedy bullet train – the Shinkansen– but alas the lure of staring mindlessly out of the window was simply too strong. It was most certainly with a sense of heaviness that I left the city for Tokyo – partly due to the fact that I had been given more presents that I knew what to do with, bringing my luggage capacity to its max – but mainly because I had grown extremely fond of Hiroshima, its people and its places. Also, that I had felt so very lucky to both be a part of its modern day landscape and to gain more than a few unique glimpses into its formative history. The closer our departure day from Hiroshima loomed, the quicker the days flew by. And yes, I had moved from the singular to the plural! Peth – aka Jonathan Petherbridge – Creative Director of London Bubble, arrived in Hiroshima looking unnervingly fresh faced and buoyant after around 20 hours of travelling; an advert for taking sleeping pills on a flight if e’er I saw one. He checked in to his hotel and then we checked out a very natty little bar close by. We ran through everything that we had done so far and swiftly went on for Sushi with Kaz – our erstwhile brilliant volunteer. Sushi turned into beer, beer turned into sake, sake turned into more sake as Peth experienced the big hearted hospitality of the Japanese, whilst squeezing into the infinitely smaller seats of the local izakaya. The following day, Peth did an interview with Han San – a Korean who had been travelled to Japan as a child with his family and had stayed there ever since. At the time of the bombing, he was around 15 years old and was working as an apprentice at the Mazda factory. His story – like all of the others – was compelling and incomprehensively horrific in equal measure. He had been working on the factory floor when he had seen a blinding light. Initially, they thought the light had been emitted from a piece of machinery. Han San had happened to be in the shade of a large piece of factory equipment. Because of this, he hadn’t suffered any serious burn damage. When he came out – everything was blackness. Outside, the air was packed with soot and dust that masked the sun. He, alongside four or five of his fellow workers fled the factory and headed for the outskirts of the city. They stayed there for the next three or four days, surviving on very little and feeling scared beyond measure. A couple of times, Han San had tried to go back into the city but each time, what he saw there was too overbearing – he simply could not process what his eyes were seeing. Dying people were all around, grabbing hold of him and pleading for water. He had to turn heel and return to the river. On the fourth day, he tried again. He walked a bit further and then he saw a man that looked like his father. It was. They were both obviously delighted. With his father at his side, Han San set out on the 20 km journey that would take him home. The ground was littered with corpses and the walk was full of all manner of fresh horrors. Han San said that he would not have been able to step over the bodies of the dead without his father next to him. When they eventually arrived at home, his family was overcome with happiness, they had – understandably – presumed that he was dead. Their home was close to an elementary school – the playground of which had become one of many cremation sites for the truckloads of bodies that were being delivered from the city. The longer the bodies were left, the greater the danger of infestation, infection and plague became. The city had mobilized quickly and corpses were being burned in their hundreds of thousands. It was not only the dead that suffered this fate, it was also the near-dead, whose eyes still flickered but who were beyond the possibilities of living. This is the playground of his child memories – it belonged to the school that he went to as a younger child. It is a school that still exists now. Though Han San had not suffered burns, after a couple of days of his return home– his hair started to fall out. As Koreans, his parents knew they would not receive priority treatment. Han San stayed at home, in his bed and was cared for by his family. Gradually, he recovered and his life slowly began to take on a semblance of normality. Mirei, one of the volunteers on the project, did a fantastic job of translating the interview and whilst his Japanese did not directly each our ears – his passion was clear and his zeal became increasingly apparent. Like many survivors, he has now devoted himself and his life to the peace movement. Like many of the survivors, his story was humbling and extraordinary. Before the interview, we had visited a possible performance space and that evening, we were due to do a sort of project launch – a packed day it was indeed. The launch was a veritable treat. Around 30 guests turned up, including some of our young interviewers, a number of the survivors, some of our supporters and volunteers and other interested parties. We talked about the company – London Bubble, about previous projects and where we were coming from, we listened to questions, we tried our best to give answers answer and we even managed to play a game. Watching all the different people that we have worked with so far, sitting side by side, all part of the same thing, all growing closer to a shared possibility – was heartening in the extreme. Afterwards, we served up drinks and snacks, chatted and got to know one another a bit better. A few people expressed their interested in being involved as performers, a few people expressed their emphatic interest about not being involved as performers and we took all our various passions and new friendships to yet another Izakaya i.e. PUB!. Then, in a blur of smiling, bowing, buzzing chatter about next steps and stages, firm handshakes and a few cheeky hugs, we took our leave. The last few days in Tokyo have brought us into the next stage of the project. We have been meeting with various possible members of the creative team. We have talked to them about what we want to do and how we think we might do it. There are still a lot of unknowns, but there is a collective will to find out what these are and how to render them know-able. The project schedule is being drafted, redrafted, drawn up again and altered as we try to find our way around how we move forward. The fact that we have managed to find a group of people to move forward with, is our pivot and our central drive. We hope the next stage will be to bring the Japanese creative team over to the UK in December, followed by possible taster sessions in January – then to start the performance workshops in April. But we will see. 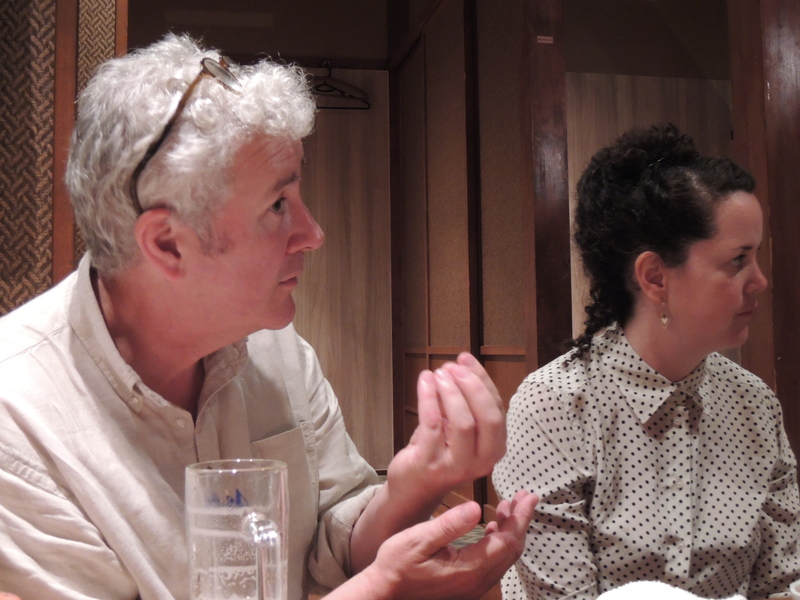 Our penultimate night in the dizzying heights of Tokyo saw us giving another talk – to practitioners of drama education and community theatre in Tokyo. During the talk, we talked about the practice of London Bubble and Peth talked about the company’s approach to making work of this kind, named by Bubble as Vernacular Theatre. Again, we also talked about previous projects, as well as what we had already done in Hiroshima and what we wanted to do next. 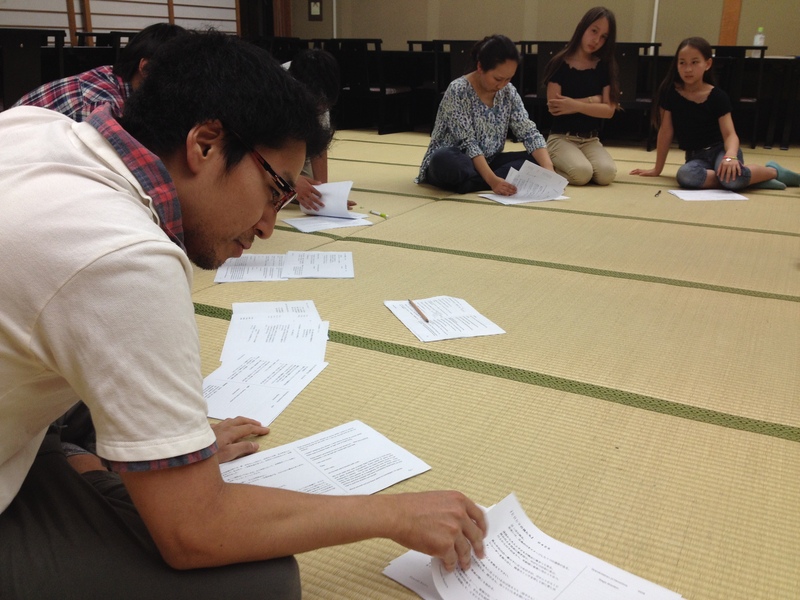 For us, it was a fantastic opportunity to find out what is happening in this field in Japan already and – crucially – to learn more about how these practitioners think we may need to adapt our process for the participants in Japan. I have spent the last few days preparing to leave. I have given away enough of my belongings to avoid excess baggage charges, readied myself for a life without Pocari Sweat – a salty, water based sports drink, it certainly is a lot more appealing that it sounds and you’ll be glad to hear that I DO have a powder sachet to make at least one or two small vats when I get home – I have tried to breathe in as many of the streets, sights, sounds as I can – lest they get away from me and I have said goodbye to the brilliant, beautiful and enigmatic gem of a country that is Japan. I am now on the plane and in that peculiar state of not-quite-there ness. I feel like this project has changed the way I think and am in a way that I can’t quite define. I am not sure how the next few weeks will pan out. I am not quite sure how I will – how we will- process everything that we have heard, seen and felt. I feel a bit apprehensive about how I will adapt to normality – or, indeed – normal tea. Actually, I am slightly over excited about normal tea. More soon, but for now – Sayonara – (makes a small bow) and thanks for joining me. On Tuesday night, I was cycling back to my rented apartment in the east of Hiroshima and it was pelting it down. Indeed, it had been heavily raining for the previous 3 or 4 hours. I had prepared my wet whether gear with some degree of pride; pride at how completely ridiculous I looked. No longer the half-fashion conscious urbanite, I had donned a full length, purple hooded anorak and a brilliant blue pair of wellies. It was truly liberating and entirely fit for purpose. On the way back – amidst the falling sheets of water – I caught the eye of a very chic, elegant lady wearing beautifully tailored clothing and kitten heels, with only a flimsy umbrella standing between her and the sky. We had a little laugh. Hopefully, it was with me, but it was most probably at me. Fierce lightening had been stabbing the skies for some time and the thunder was beyond rumbling. I questioned how sensible it was to be cycling, but also tried to reassure myself with the fact my wheels were rubber and that they would help ground me, should lightening decide to come my way. This made me feel better, as did singing a few refrains from The Sound of Music’s “my favourite things”– a la Julie Andrews. Part of the road I was headed along was completely immersed in water, probably about a foot and a half high; I got off my bike and waded through. There was a man a couple of metres away with a video camera, filming everything. I then realized that this was perhaps all a bit out of the ordinary. I gave a silent nod of thanks to my wellies and carried on. Throughout the night, bangs, blasts and nigh-on biblical rain came in and out of my sleep. I remember being woken by a particularly massive blast, half conscious of something being seriously amiss and half still pretty much asleep. When I woke up, I tried to search the news to see what had happened – but perhaps predictably, as I had searched in English, nothing came back. Daylight seemed to return normality to the streets, people were going about their daily business and nothing seemed hugely different. But, gradually, reports started to flock in. Miki, a friend who works at the NHK, e-mailed to say that landslides had occurred in northern Hiroshima and there was 18 dead. This figure rose to 20, then to 35. Now it’s over 40 and at the time of writing, there are still missing people unaccounted for. The youngest of these is 2 years old. Another is a 53 year-old rescue worker, who having managed to pull a number of people to safety was killed in the second wave of landslides. The story dominated the local news and then I started to get messages from friends at home, so I guess it had made the international news as well. This is a local story, happening in real time – it is happening to real families, who live in the community now. It’s not as if the deaths incurred by the atomic bombing haven’t already been brought home to me, I have now been present at over 16 interviews and I have seen, heard and felt the tragedy experienced by the survivors. But, there is something about being here at a time when a collective tragedy is happening, albeit on a much smaller scale – and as a result of a natural, not inherently un-natural, disaster – that is a sobering reminder of the real, personal injury and losses sustained on August 6th 1945. Those that were killed were people’s cousins, best-friends, sisters, brothers, dads, partners, mums, sisters. 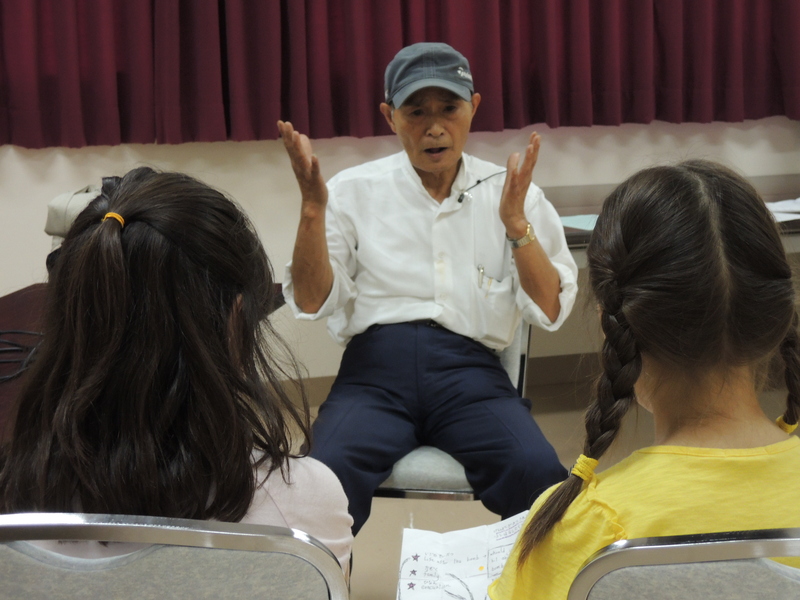 The Atomic bombing obviously made the news on a local, national and international level, but at its core – it was a local story happening to the community in Hiroshima. For these people, it wasn’t about politics, or military strategy, or national pride, it wasn’t about winning or losing a war. It was about losing a brother, not having any parents, not having any friends left – or indeed losing an entirely family. And for the even less lucky ones, losing everything. Everyone here is following the news closely, but life continues. Beyond the afflicted area, you wouldn’t have any idea that anything untoward had happened. People move around the daily business of work and living. Apart from, that is, the families of the 40 plus people who died: their worlds have changed forever. Yet, once again – Hiroshima picks itself up and carries on. Those blue wellies are in the porch and they have lost a bit of their comic sparkle. I’m sure they’re hoping, as I am, that they won’t have to be worn again for a while yet.